More alarming than the bad results for the Social Democrats is the success of the AfD, which won 12.6 percent of the vote, a result unforeseen by early polls that predicted election gains in the single digits. 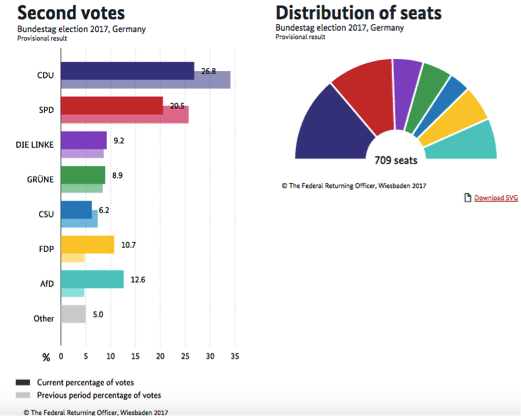 The AfD is now the third largest party in the German parliament. Even more troubling is the geographical variation: in the eastern regions, the AfD received more than 20 percent of the vote, making it the second biggest political force after the CDU. In Saxony, one of the eastern regions, more people gave the AfD their vote than any other political party (27 percent). Why, one wonders? Unemployment in Germany is at 5.7 %, its lowest level since unification (although it is higher in the eastern German regions), fewer refugees have come to Germany since Merkel’s deal with Turkey’s president Erdogan in March 2016, and of those refugees that came in 2015 very few ended up in the East. Refugees seeking asylum in Germany are distributed across the German Länder according to a formula that takes into account regional economic strength, which is significantly lower in the East. While immigration was the “number one issue in this election” according to Cas Mudde — at least for AfD supporters — there seems to be a curious geographic disconnect between anti-refugee sentiments and the actual physical presence of refugees. Wilsdruff, for example, a smallish town with 13.900 inhabitants near Dresden, hosts a total of ten refugees according to the city administration, but (per Spiegel online) more than every third resident voted for the AfD. Why should we worry about the AfD? Below its glossy bourgeois surface, presented by media-friendly faces like Frauke Petry and Simone Weidel, looms a much less pretty conglomeration of newly elected members of the German Bundestag (94 out of 709 seats), many of whom have made statements that are more than a little disconcerting, ranging from a Alexander Gauland’s relatively harmless “we are going to hunt her, we are going to hunt Merkel or whomever” to his statement that Aydan Özoguz, the German Minister of State in the Chancellary, needs to “be disposed of in Anatolia”. The AfD is now clearly a radical-right party far removed from its roots as a neoliberal party primarily concerned with public finances. Gone are the days in which Bernd Lucke, economics professor and the party’s founder, complained about a possible “pooling of sovereign debt in the Eurozone”. Back then, in 2013, TV stations refused to invite Bernd Lucke to roundtable discussions to avoid normalizing radical-right discourse. With the “refugee crisis” replacing the “euro crisis” as the party’s main rallying issue, Bernd Lucke was quickly displaced as party leader in 2015. On election night, we saw a different type of ‘political personnel’ representing the AfD. They did not sit in the audience as Bernd Lucke did in 2013, but at the roundtable, side by side with the leaders of the other political parties. How quickly have we come to normalize radical-right political discourse? This is sad, and worrisome, and very frustrating, but not entirely hopeless. 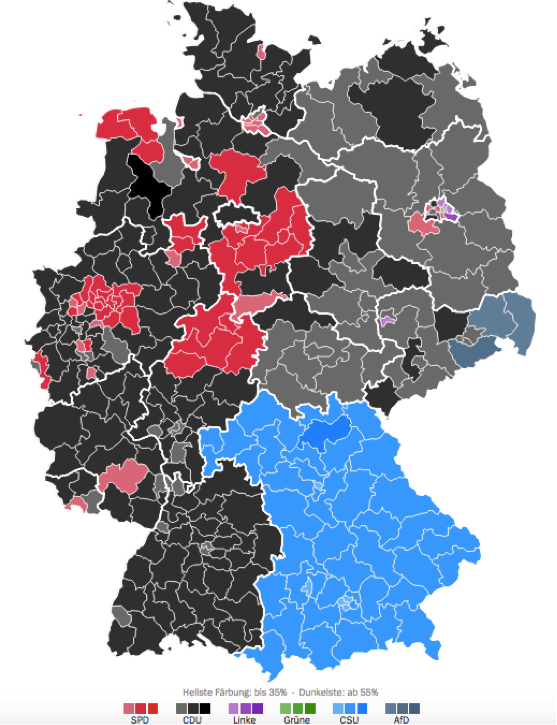 Although the AfD is significantly stronger in the East than in the West, it has only managed to win three constituencies – the German system is a mix of a first-past-the-post and a PR system – in one eastern region: Saxony. In the other four eastern regions (five if we count the eastern part of Berlin), the AfD did not win any constituency. This is better than I anticipated. Riding the train through Mecklenburg-Vorpommern, Brandenburg, Thüringen or Sachsen-Anhalt – usually on my way to more populated, and frankly less destitute places – I identified them as potential strongholds of the radical-right. Yet, in a direct face-off with candidates from other parties, radical-right candidates have lost in all of those regions, except in Saxony. Voters have tended to use their second vote (‘PR’ vote, pictured above), slightly more so than their first vote (FPTP vote, pictured below) to support the AfD. Exit polls suggest that voters’ motivation supporting the AfD was a general frustration with other political parties rather than an outspoken support for the AfD – 60 percent of AfD voters that were surveyed claimed that they voted for the radical-right because they were frustrated with other parties, while only 31 percent of AfD voters stated that they voted out of a firm conviction. If this is indeed true, then there is hope that their votes can be won back in the coming four years, one-by-one and very slowly. A first step in this direction is the SPD’s decision to go into opposition, a decision supported by the party’s elites and the majority of its members (74 %). The last four years of sharing government responsibility with the Christian Democrats seem to have left the party in a terrible state despite the aforementioned policy gains. The hope is that, with the Social Democrats being the main opposition party rather than the AfD, the political debate can evolve around important economic left-right issues again. Indeed, every single political party leader (except the AfD co-leader Jörg Meuthen) has come out criticizing the media’s obsessive preoccupation with the refugee question. They were particularly uneasy about the 90 minute long televised chancellor debate between Merkel and Schulz on 2 September, the first 60 minutes of which were spent on the questions related to refugees and the role of Islam in Germany, leaving little room for other pressing issues. On the night of the elections, during the traditional roundtable discussion with all of the party leaders (Elefantenrunde), Angela Merkel exasperatedly asked: “And what about North Korea and Kim Jon-un? What about Russia? And China? And the EU?” Karin Göring-Eckardt (Grüne) wanted to know why climate change wasn’t discussed more and Martin Schulz (SPD) and Katja Kipping (Die Linke) wondered why moderators and journalists never asked questions about rising inequality, poverty, increasing rents, badly paying jobs, and lacking childcare. In the coming fours years, the media will have to think hard about how it should cover the AfD and it will have to ask itself whether it somehow contributed to a one-sided political discourse that helped a radical-right party rise. With the SPD as the main opposition party, there is at least a chance that voters do not perceive the AfD as the only dissenting voice in the German Bundestag. Not everyone is happy with the SPD’s refusal to join a fourth Merkel government. Angela Merkel herself noted that “these are troubling times and everyone carries responsibility”. The morning after the election she announced that she would also like to begin coalition negotiations with the SPD. Should negotiations for a “Jamaica coalition” between the CDU, the Liberal Democrats (FDP), and the Greens (Grüne) fail, which would require new elections, the SPD will have to reconsider her decision. But what is the price to be paid for another grand coalition? Voters have complained about the lack of alternatives, about the main parties CDU and SPD being indistinguishable, about lacking dissent, and about elites being detached from voters. Maybe the SPD and Die Linke in opposition will be able to provide a clear alternative that is more attractive and compelling than the AfD’s vision. The AfD is lacking a clear profile in almost all policy areas except immigration, and it seems to have little interest in governing. AfD member Alexander Gauland declared in a TV show on election night that presenting constructive policy proposals “is not the AfD’s main task”. The morning after the election, Frauke Petry, the AfD’s current party leader who won her constituency in Saxony, declared that she does not want to be part of the AfD parliamentary group. Often attacked for being too moderate by her own party members, she has now left the party. The infighting has already begun. Let us hope that the AfD will be so preoccupied with its own power plays that it has little time to destroy liberal democracy.